14 Students worked on various aspects of building the Robot i.e Mechanical, Electronics and Programming. The Mechanical team create and design the structure of bot such as the throwing mechanism, projectile mechanism, chassis of bots. Electronics team and programming team worked on the control of mechanical structure, and providing brain to entire system. Working on this year’s challenge of creating and manoeuvring a BOT to knock out a Beach ball located on the table and then land a disc on seven tables located at different distance with varying heights on the table. The team demonstrated its expertise with their ability to make the BOT economical as well as with good aesthetics. A robust design that did not need repairs or maintenance during the 5 day event. The electronic circuits were designed intelligently, with minimum wiring and a single printed circuit board. Student Team Leader Pradeepkumar Choudhary said “My journey with ROBOCON KJSIEIT started back in 2014, since then I have been an integral part of a team which has developed my technical and managerial skills to a great extent. Here I learnt to cope up with working and delivering on problem statement in a given time span. Students working in the team have extra edge over their colleagues because apart from technical knowledge they develop skill of working with synergy in team. Overall my time has been great in ROBOCON and it was experience I will always cherish”. 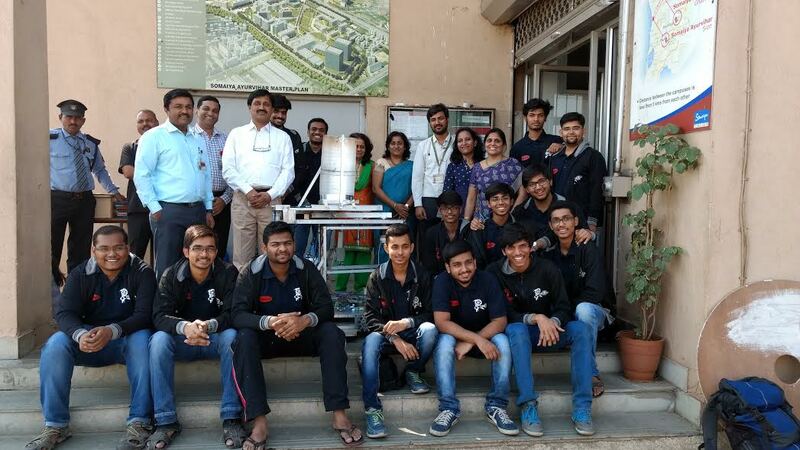 Assistant Prof. Mr Prashant Upadhyay added :“As a team our aim is to fabricate a Robot exactly as specified by the theme of the competition. We first participated in the competition in 2013 and since then the Robocon team has grown tremendously. Our dream is to be the winner of this competition and win many other awards and recognitions”.